Every year on Christmas Eve, my sister-in-law Megan makes French onion soup. We were fortunate enough to partake in this annual family tradition during our trip to Huntsville, Alabama this past year. 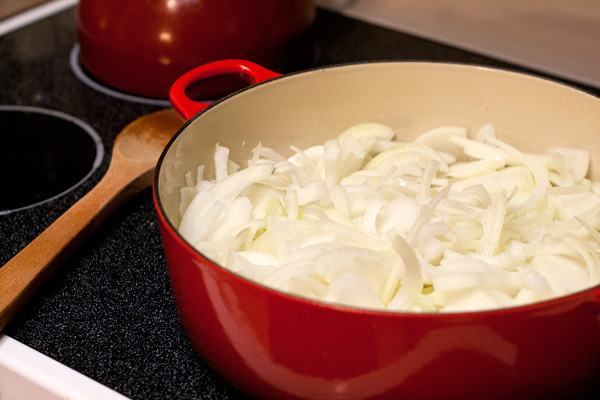 Her “tried and true” French onion soup recipe was passed along to her by her mother, and she was kind enough to share the recipe with us. It’s easy to make and ideal for a cold winter night. Megan recommends that you make it a day in advance because it’s better on the second day. After about 20 minutes, the onions become soft and sweet. Then add flour and stock, and stir constantly. Season with pepper, and simmer for 30 minutes. At this point, you can let it cool and place it in the refrigerator overnight. Re-heat the soup on the stove top the next day, then ladle it into oven-safe crocks. Add cubed and toasted bread and lots of cheese. Broil 1 to 2 minutes until cheese is golden and bubbly. Instead of broiling, you could add the toasted bread and shredded cheese to the bottom of a bowl and ladle the hot soup on top. Or, if you are daring enough, use a kitchen torch to melt the cheese. What fun food traditions does your family have? Set a large stock pot or Dutch oven over medium heat. Melt butter. Add onion and saute, stirring frequently, for 15 to 20 minutes. Add flour and mix until smooth. Add beef stock gradually, stirring constantly. Season with pepper. Cover and cook over low heat for 30 minutes. Ladle soup into oven-safe crocks. Place toasted bread and shredded cheeses on top. Broil until cheese is bubbly, 1 to 2 minutes. 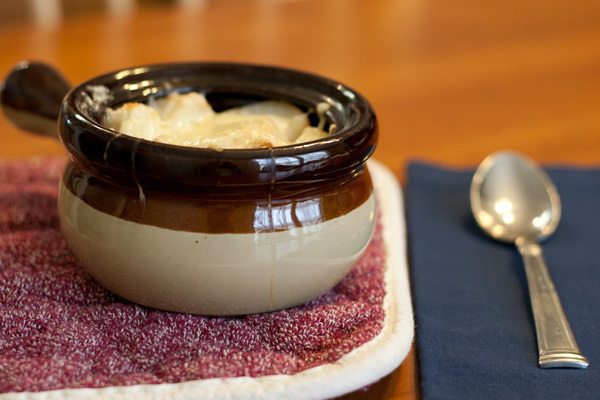 Megan, I was a little shocked when I saw your family recipe that you had so graciously shared with friends for Onion Soup had been published on Pinetrest. I always feel a little violated when I share a “sacred” family recipe with someone and they feel free to share it with the world; however, you were gracious enough to respond with details to make the final results better. This is very close to my recipe and it is soooo good. 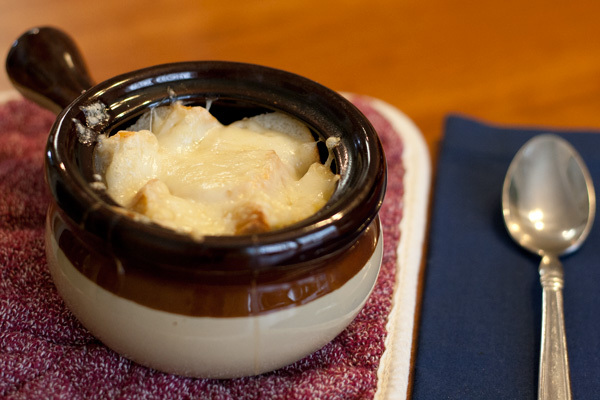 I just love Franch onion soup – mostly for the soggy bread and melted cheese! This version looks great!